Hello lovelies! How are y'all doing today? I have some rather exciting news to share with y'all today. Today marks the day that I started, Bramblewood Fashion five years ago. Can you believe that? I've been blogging just about non-stop for five years. So much has changed in those five years: my style, my taste in music/movies/TV shows, and hopefully, my writing & general posts have improved since those first couple years. Btw, if you would like to see all of my previous birthday posts, click here. 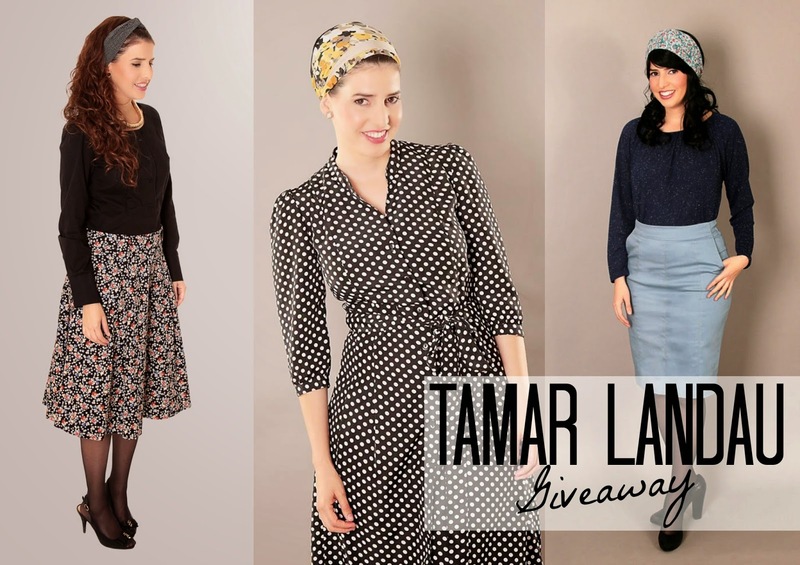 To celebrate my five years, one of my sponsors for this month: TAMAR LANDAU a modest clothing line on Etsy, is giving one of my readers the chance to win a beautiful polks-dot dress! Full giveaway details will be below. Which is perfect, since polka-dots are one of my favorite things [along with stripes & leopard print]. Anyhow, this dress will be perfect for the autumn season that is coming up: with some boots/booties, tights, and perhaps either a jean jacket or cardigan. Sounds dreamy, huh? Onto the giveaway rules. One winner will be winning the Black Polka-Dot A-Line Dress in your size [or perhaps you will like to gift the dress to your mother, grandma, or sister!]. This giveaway is open internationally. On August 31st, 2014 at 11:59pm [EST] the giveaway will end and the winner will be emailed later that week. I have been following Bramblewood Fashion for about 4 years (I think!). I love their romantic a-line modest dress with flowers. Super chic! Wow. I didn't realize it, but I've been following you for at least 3 years or so! Some of my favorite posts have been your posts about classic films and some of your favorite things from different decades (like the 50's and so on). :) Keep on blogging! Happy 5th! I just started following them and I love the a line modest dress with flowers! so me!!! I love the "Classic Modest Blue printed midi dress with 3\4 sleeves and belt" - blue and belts are my favorite! I'd have to say my favorite item is either that black polka dot dress or the dark blue polka dot dress! ooooo! what a pretty dress! would love to win it! I'm not quite sure how long I've been following - a year and a half, or so, maybe? =P I love the outfit posts - very inspiring. Also the posts about vintage clothing. Actually the Black and white polka dot dress is my favorite! I would love to win it! Congrats on the anniversary Ashley! I have been following your blog for almost a year now! I really enjoy the different outfits with the same components so I can see how to style one thing multiple times! Very Helpful! Oh, I think my favorite is the purple midi dress! The color is lovely and I love the shape and style of the dress. I've probably been following for about 2 years.... I like your posts with reviews! Thanks for the chance to win, Ashley! I love the Black Polka-Dot dress shown above... it would be perfect for church! My favorite thing on their page would have to be Polka-Dot Beige Midi dress with gatherings... so cute! Thanks again! Ooops, I forgot to ask, have you ever tried any of their items before? I have been following you since I started blogging: September of last year. It would be hard to say what my favorite post has been, but I really enjoyed the one about making your own graphic tees... I want to make a Sherlock one at some point! I've followed your blog for a few years now. I really like your 50's make-up video tutorial. I just started following today! Dee Lafrenz - I love the Supreme Cold shoulder Tee in blue. It looks so flattering. My favorite item is the Modest midi A-line skirt, with floral print! I have been following you for around a year(I don't exactly remember, but I know it has been a while!) . I love the romantic a-line dress with florals! I think that one of my favorites is the Blue modest classic midi dress with gatherings and belt. I have been following you for about 3 months, I think?! My favorite posts that you do are outfit posts. Thanks so much for having wholesome blog with never any bad content. The black and white polka dot dress is actually my favorite. So classic and pretty. Oh, that's such a cute dress! All the dresses are so beautiful. Congrats on the blog! I love how much your photos have improved since you first started:) You're doing great! I've just started following, but I've often looked at your blog before that. My favorite posts are your book hauls. I drool over them! (hmm, drool is not a very nice word). I love the purple French terry Barrett hat! Adorable! I just found out about your website through this contest that someone posted on G+! Great giveaway! Thanks for sharing. I love their classic blue dress! Thanks for sharing. Thanks for hosting! One of my fave items would be the classic blue printed midi dress with 3/4 sleeves + belt. Cute, cute! I like the purple classic modest midi dress with delicate black print and the modest pleated black woven midi dress with chic dots print. I don't wear headcoverings for spiritual reasons, but I would wear a lot of their headbands just as a fashion accessory. I like the twist styles and the bandana styles. Congratulations on 5 years Ashley! I wish you many more happy blogging years! I've been following you for almost two years. I love the beige classic modest midi dress with gatherings and dot print. My favourite thing from TAMAR LANDAU, is the black polka dot dress... It's so classic and timeless. Black modest A - line buttoned dress with dots print and belt is certainly my favorite. I followed you some months ago. My current favorite video is the song "Word crimes" by WEIRD AL. congrats on 5 years! ;) love this polka dot dress. cute!!! love that skirt! the print is cute and its a great length. I actually really like this particular dress! I'd have to say that this dress is my favorite, though I love the Black Polka Dotted one as well! i like Coral Red modest A - line buttoned dress with floral print and belt! it's so pretty! I've been following BF for quite some time, I enjoy your outfit posts and makeup posts a lot! My favorite thing from TamarLandau is the Classic Modest Blue Midi Dress. The dress is beautiful! I think it would be really fun to style! I've been following Bramblewood Fashion for about a year now, and I LOVE your posts! I'm not sure which my favorites are, but i really like you videos! And your What I Wore posts. What a wonderful resource! I love the polka dot (black) dress. I love the black polka dot dress! I love this vintage style. I love the beige midi dress! I love that most of the pieces have pockets. The coral a line floral dress is my favorite. I love the romantic a -line modest dress with flowers!! The Romantic floral A - line dress is my favorite. Such a pretty color. I love the Coral Red modest A - line buttoned dress (floral). Lovely! I like the blue long sleeve modest shirt. Happy blog birthday! Five years is something to be proud of. :) I adore the classic pleated floral skirt! This dress is my favorite!! I'd love just wear it! Oh my goodness, congratulations on your bloggaversary! Such cute dresses!